A pivotal moment in the young Paul Kenton’s life was a move from his birth place in Derby to the West Country when he was eight years old. As a teenager he learnt to surf on the wild beaches of North Devon and as a keen surfer he has travelled the world realising inspiration for another passion; his art. Now settled in Ilfracombe with his Brazilian partner, Alexandra and two young daughters, Kenton still surfs when he’s not in the studio or enjoying the hectic pandemonium of family life. Paul showed an interest in painting from an early age; while others wanted to be doctors or pilots he clearly remembers telling a friend that he wanted to be an artist. This was cemented when, at the tender age of twelve, he won a national colouring competition – winning a prized set of paints. He continued to draw and paint all through school becoming proficient in watercolour but was disappointed not to be awarded a place at Art College due to his English grades. His disillusionment drove him in another direction and he studied the rigid disciplines of industry and was awarded a Bachelor in Engineering from Stafford University. After University he worked as a draughtsman for several years while still painting in his spare time. In 1995, supported by a grant from the Prince’s Youth Business Trust, he took the plunge and started to paint full-time and began exhibiting. Working in acrylic and oils he took inspiration from his world wide travels; the cityscapes, cafes, harbours, bridges and seascapes. Kenton’s style has evolved over the past ten years into a free-flowing fusion of various media, capturing the essence of the location rather than “the fiddly details of what something looks like” creating an atmosphere with free shapes, dripped lines and colour. 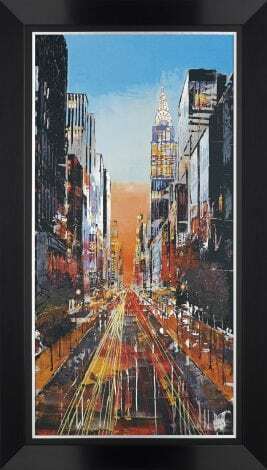 A boutique giclée on aluminium by contemporary cityscape artist Paul Kenton. This stunning limited edition book showcases Paul Kenton‘s spectacular Metallique collection.